Unmatched quality, for total confidence. Your digital command center. More data. More flexibility. You're in the know, completely. It doesn't get any better than this. Now you can have the power of SmartCraft on your mobile device (iOS or Android) with all the digital data your SmartCraft engine supports! More than information. A digital control module. Mercury Marine changes the boating industry. Marine engine technology has evolved. Mercury Marine continues to expand its outboard and marine engine technology. Mercury is leading the industry with boating innovations from Zeus joystick technology to VesselView displays, Joystick Piloting for Outboards, Active Trim, and Skyhook GPS digital anchoring. In 2016, Mercury introduced the VesselView Mobile app for iOS and Android, and an updated joystick and skyhook feature to its portfolio of technologies. You're fully covered. Right down to the controls and gauges. The outstanding warranty coverage on Mercury engines also extends to the controls and rigging components on your boat. If your builder or dealer uses genuine Mercury gauges and controls when installing the new engine on your boat, the warranty coverage for those rigging components now matches the total warranty of your engine. This means you could have up to an additional two years of control and rigging component coverage – based on the engine purchased. 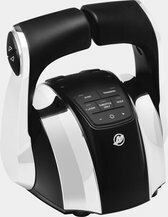 Mercury's patented Joystick Piloting System delivers 360 degree directional control. The Skyhook Digital Anchoring System holds your boat in a fixed position regardless of wind or current. Active Trim is the only auto-trimming program that uses GPS and speed. SmartCraft DTS (Digital Throttle & Shift) delivers precise handling and total control. It also seamlessly connects with compatible displays and features automotive-style power steering. SmartCraft. Boating with a higher IQ. SmartCraft® is a full suite of digital technologies, fully integrated and totally coordinated. Gauges, sensors, vessel systems, computer-controlled features – one total package, one high level of control. Make your boating experience easier, safer, and a lot more enjoyable. Get smart. The premier engine information display. Combines all functions on the vessel, presented through a clear, direct, sunlight-viewable, full-color display. The affordable, reliable, high-value digital vessel monitoring system. Allows you to select and display three separate pieces of data at once. The marine industry's most advanced gauge, offering essential vessel information in plain, descriptive, easily understood language. The SmartCraft Digital Throttle & Shift (DTS) system. The epitome of smooth, precise shifting and lightning-fast throttle response. No cables. No hesitation. With a solid, proven track record for performance and reliability. Whether you choose digital or analog, you've chosen the best. Gauges and displays that work better, read better, look better, and last longer. A gauge for every boat and boater. 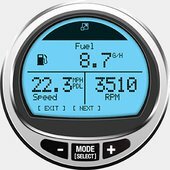 From classic to contemporary, Mercury® has the gauges and displays that fit your boat and your needs. A broad range of styles, colors and shapes, as well as analog and digital versions. And always, above all, built to the highest standards for quality and reliability. Classic simplicity. Displays that typically have a pointer and scale to indicate a specific measurement such as speed, rpm, trim, or fuel level. Connected by wires that carry signals from the engine. Fully compatible with all engines -- including FourStroke, Verado® and OptiMax®. Digital gauges brought on-board through the SmartCraft® digital package. The idea? Total integration of all critical data and information. Speed, fuel, depth, rpms - everything. All accurately and clearly displayed - including advanced, multi-function, touch-screen LCD displays. Compatible with all sterndrive, Verado, OptiMax, and FourStroke® engines 40 hp and above. Controls and gauges that have to face the ultimate test. Mercury engineers. Getting past a Mercury engineer is no easy task. There’s lab testing. On-water testing. Race testing. Often up to 1,000 total hours before the control or gauge is fully certified by Mercury engineering. And worthy of your boat. At your fingertips, and your command. Matched to your boat. Your helm. Your life on the water. You want the right engines on your boat – and the right controls as well. Choose from a full range of multi-engine control packages. With panel, flush-mount, console, binnacle, or top-mount installations. SmartCraft® gives you total vessel integration. A complete suite of digital technologies united in one powerful, integrated, on-board vessel management system – from controls and Digital Throttle & Shift (DTS) to digital gauges, sensors, alarms and other on-board electronics. You're in control of the boat. And everything else. Takes the guesswork out of pulling skiers, tubers, and wake boarders. Create a custom launch profile for each rider. Plug it into the system once, enjoy a perfect launch speed every time. Just hit the throttle and go. 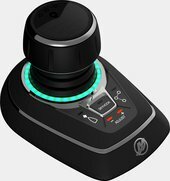 Axius Joystick Piloting for Sterndrives. Docking is no longer nerve-racking. Axius® Joystick Piloting for Sterndrives gives you absolute, pinpoint accuracy, stem to stern, regardless of wind, waves, and current. Allowing even relative beginners to approach the dock confidently and effortlessly, from any angle. Mercury Marine is the only marine engine manufacturer to offer joystick piloting for outboards, gas and diesel sterndrives, and pod drives. Instant response, total control. No hesitation, no comparison. No cables either. Only from Mercury.